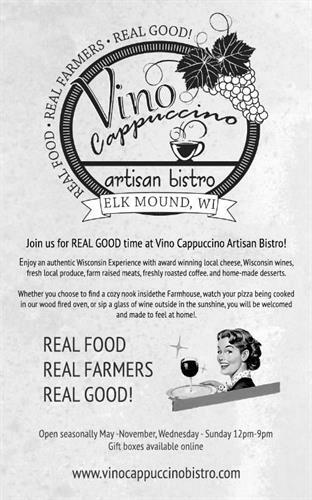 Vino Cappuccino Artisan Bistro is a place where you can experience authentic Western Wisconsin food, art, music, and fun. Our wine bar and coffee shop offers an array of seasonal dishes from local farmers and suppliers to enjoy, accompanied by coffee drinks and wines from the Chippewa Valley. You’ll savor the flavors of the seasons in the historic setting of Vino Cappuccino Artisan Bistro. No matter when you visit, you'll discover a wide variety of dishes featuring ingredients from local Wisconsin farms. Our wood-fired pizzas, sandwiches, soups, salads, and desserts are all made fresh to order. Vino Cappuccino also has a carefully curated selection of wines for you to sample and enjoy. Surrounded by art, music, and history, you’ll enjoy a laid-back atmosphere and friendly staff, giving you a unique Chippewa Valley dining experience. Real food – Real farmers – Real good! While you dine, you can check out the latest and greatest art from the best local artists. Each month, Vino Cappuccino features a new local artist. We display the area's finest painting, pottery, music, and more! Exit 61 off HWY 29 in Elk Mound, WI.